The snake was discovered in Cairns, Australia, and weighed a whopping six stone. A giant snake, so large it was originally mistaken for a crocodile, has been discovered in Queensland, Australia. 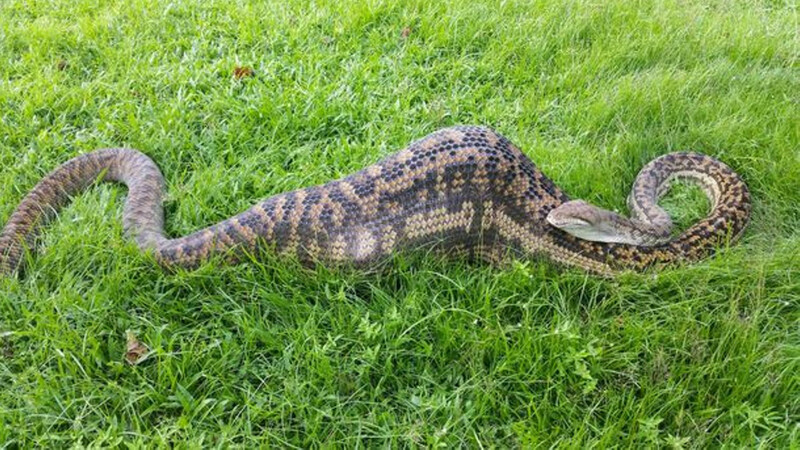 Snake hunters came across the 16-ft Python in Cairns after initially believing it to be an altogether different type of giant reptile, as it had expanded in size after swallowing a kangaroo. Rini Steenwinkel, a local resident, first came across the giant snake, with a video of the sizeable serpent soon finding its way online. Things got a little trickier when Steenwinkel contacted Cairns Snake Removals to get the reptile taken away though. “The snake catcher didn’t believe me when I described how big it was, but he turned up and said, ‘Holy crap’,” he told National Geographic. Even then, the actual process of relocating the large python proved problematic, with reports suggesting the reptile weighed an estimated six stone. To put the snake’s size into some kind of perspective, it’s estimated that its diameter was the equivalent to the size of a two-litre bottle of Coca-Cola, with the consumed wallaby roughly 31 inches long and 15 inches wide. The snake catchers were so impressed by their haul, they ended up removing it for free, though Steenwinkel may not have realised how much danger he could have been in. Known for killing their prey before consumption, pythons start by constricting their victims, cutting off blood flow to the body, to prompt heart failure. They then slowly swallow their prey whole, using a series of tiny muscles and tendons that allow them to stretch themselves over an entire body. What Steenwinkel probably didn’t realise was that one man had already suffered that very fate earlier this year, in Sulawesi, Indonesia. Snake attacks remain extremely rare but, given the size of this bad boy, Steenwinkel may have had a lucky escape with the abnormally large reptile subsequently relocated to a nearby creek.